Thanksgiving came and went in a huge blur, so now I can give my full attention to my blog once again (until Christmas, that is!). 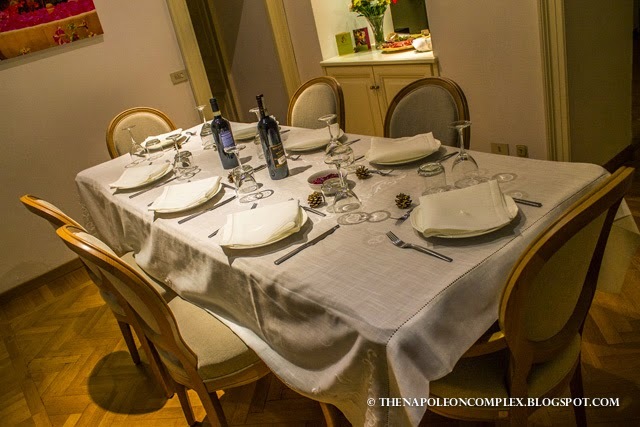 This was our second Thanksgiving in Rome, but last year it was a much more intimate affair for us. We had just moved in to our apartment about two weeks before, so I really only had time to get a turkey breast for Jaime and I. Earlier this year, one of Jaime’s Italian coworkers asked us if we did a full turkey on Thanksgiving like they see on tv. 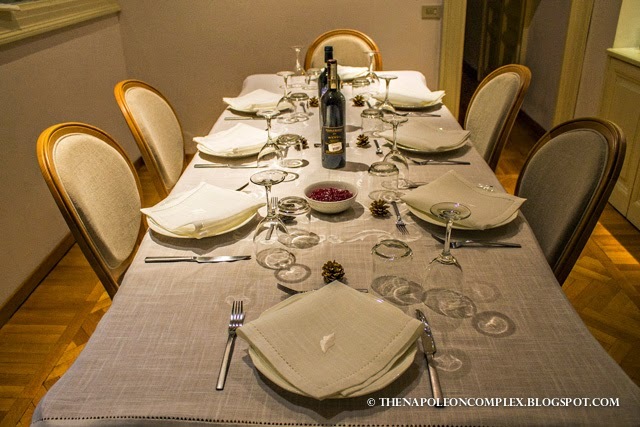 That’s how Jaime and I decided that we had to do a full traditional Thanksgiving dinner for our Italian friends. 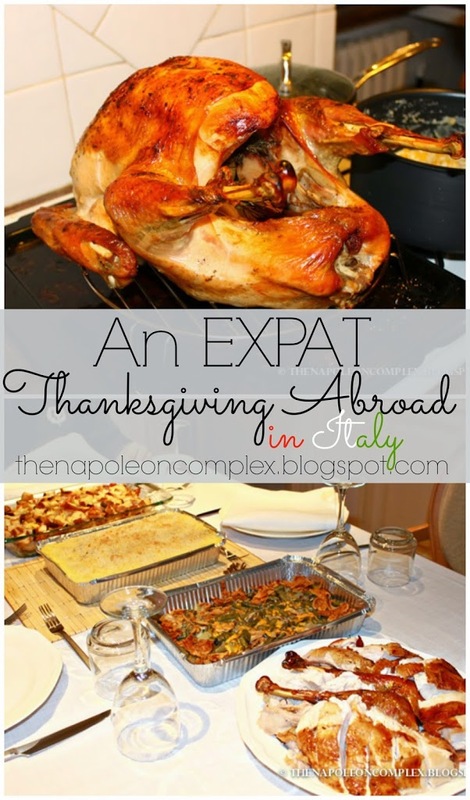 A lot of my fellow expats in Italy say that celebrating Thanksgiving can be a bit stressful, considering that some of the ingredients we need to make the most traditional dishes can be hard (or impossible) to find. Honestly, this hasn’t been my experience at all. Sure, if you want to buy box cornbread stuffing, gravy in a jar, and store-bought pumpkin pie, you will be sadly disappointed. But if you make everything yourself, as I like to do on Thanksgiving, most of the ingredients are easily available in any supermarket. One of my favorite pictures. I’m always very proud of my cheese platter skills. The most difficult thing to get, I’d say, is a full turkey. But, if you go to a butcher, and explain what you want and what it’s for (most Italians know what La Festa del Ringraziamento is) you’ll be able to get it. Just don’t wait until the last minute of course. They might look at you a little weird, but you’ll get your turkey. As for other shortcut ingredients, Castroni is a great resource we have in Rome, where you can usually find canned pumpkin and other American pie fillings year round. But worst case scenario, there are pumpkins in big supermarkets that you can buy to make your pie from scratch. Another tip that has made my life infinitely easier for Thanksgiving and other American dishes is to give it a little Italian flair using Giada Laurentiis’ recipes. Her recipes taste great and use a bunch of ingredients that are extremely easy to find in Italy (bonus is that all those Italian freshly-grated cheeses she uses are cheaper here than in the U.S.). Alton Brown’s Good Eats Roast Turkey – It was my first year making the turkey using this recipe but nearly 5000 5 star reviews on the Food Network can’t be wrong. I will say it was a little scary as to how quickly the turkey reached the desired 161ºF, so I chickened out and left it in the oven for a little while longer. It still came out moist and delicious. Giada’s Ciabatta Stuffing with Chestnuts & Pancetta – See what I mean about easy to find Italian ingredients. This was also a big hit with our guests. Gilda’s Baked Mashed Potatoes – This has become my go-to mashed potatoes recipe. I made it last year for Thanksgiving and I’ve made it throughout the year a couple of times for big groups. It’s the best! Paula Deen’s Green Bean Casserole – Can’t do traditional dishes without Paula. This was the dish I made less of, thinking that it would be the least-liked by our guests, yet it was the one they raved most about! Cream of Mushroom soup can be made from scratch, as well as the fried onions, if you can’t find the canned American versions. Southern Creamed Corn – This recipe didn’t thrill me, but it was the first time I’ve ever made creamed corn, so maybe I just need a little practice. Gravy – I made the gravy ahead of time using this recipe I found on Pinterest and I gotta say, I loved it! Paula Deen’s Pumpkin Pie – One of our friends was much more familiar with American dishes (because he’s lived in the States) and when he saw the Pumpkin Pie he exclaimed, “This is definitely a real American Thanksgiving!” (as if the rest of the dishes didn’t clue him in haha). I made two pumpkin pies this year, one for our home and one for Jaime’s office and both groups are asking me for the recipes, so pumpkin pie is a big hit for Italians. 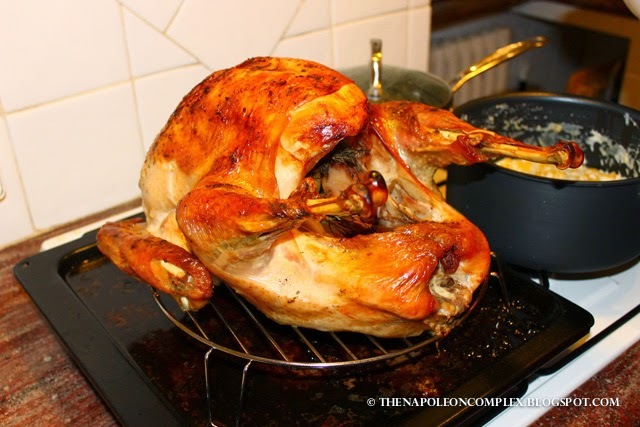 Another thing to be wary of is turkey size for your small Italian ovens. I brought my turkey roasting pan from the States but it is way too big for my oven, so I had improvise with other pans. Lucky for me, a 12 pound turkey was enough for our guests and fit perfectly in our oven. My turkey carving skills are also pretty amazing, if I do say so myself. It was also my first time! #ThanksgivingFail story: I let Jaime carve the turkey the first time I made a turkey two years ago and he butchered it beyond recognition. 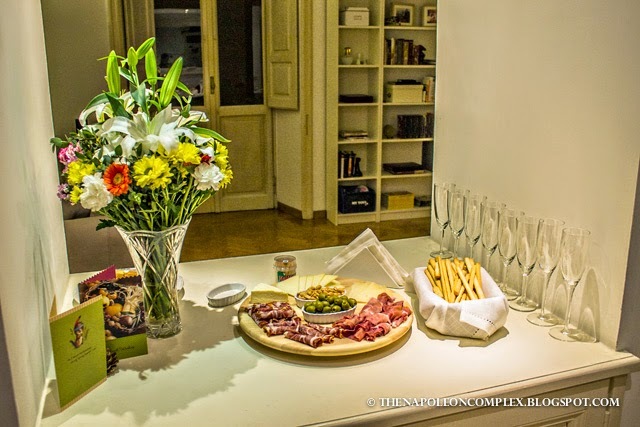 While it is true that Italians are very careful about the foods they eat and are obsessed with things like “lightness (of the meal)” and “digestibility”, they are very open to having American dishes, which are definitely not known for any of those traits. 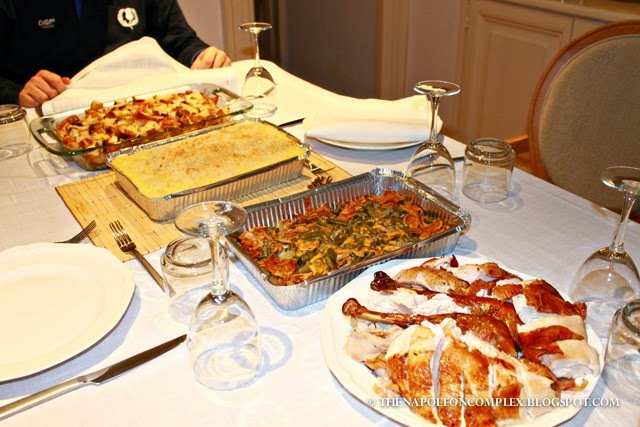 So, all in all, I’d say the most stressful thing about an American Thanksgiving in Italy (apart from the preparation and planning) was the worry that the food would be too heavy. 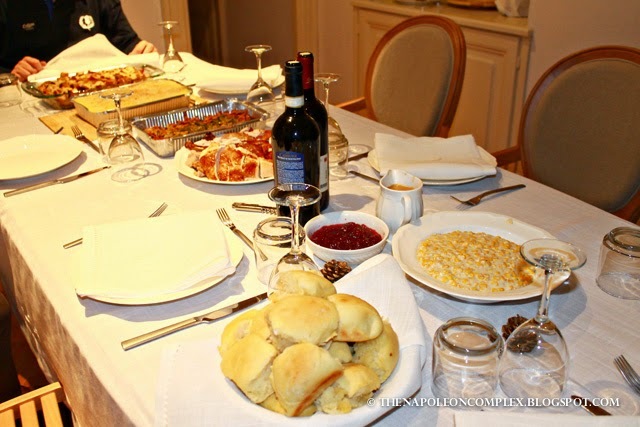 Instead, my fears were completely unfounded, because this group of Italians, at least, almost left me with no leftovers (that’s one Thanksgiving tradition that I definitely do not care for)! This photo would never have made the cut to get on the blog if it wasn’t for the fact that it’s the ONLY picture we have together of the night. We didn’t even take a group picture! 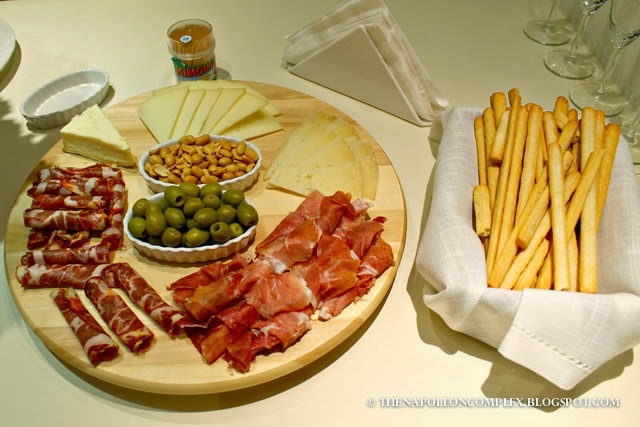 Bonus: Italians give great hosting gifts! What you see above is a 5kg business size Nutella jar. 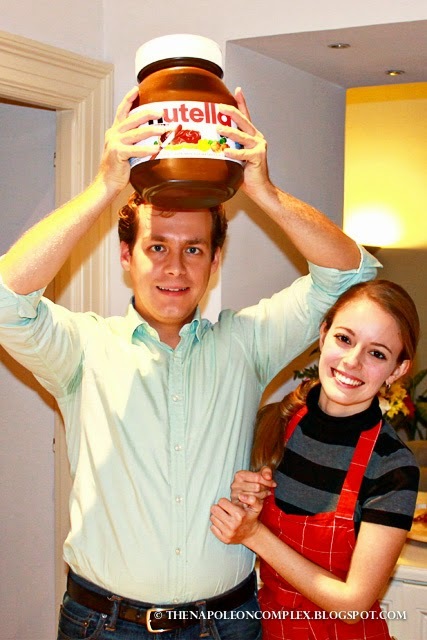 That’s 11.02 lbs of Nutella, people!! Haha, funny you mention that, I already ordered una paleta de puerco from the butcher. It’ll be hard to find yuca and naranja agria para el mojo… Eek! What a fab Turkey dinner!! Good job!! And what an awesome hostess gift! I may be asking for one of those for Christmas haha!! Thanks, Jamie! Jaime is obsessed with Nutella (who isn’t?!) so he’s definitely excited to dig into that!